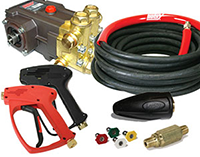 PSI Equipment is your local Hotsy dealer stocking thousands of pressure washer replacement parts. One call does it all when you need a part! We are competitively priced and have genuine Hotsy parts as well as other products suitable for all pressure washer models. You’ll find our selection to be competitively priced and our staff knowledgeable. We’ll make sure the part you need is right for your size of pressure washer, something you may not know when ordering online. Flat surface cleaner - great for cleaning surfaces such as driveways, parking garages and sidewalks. Similar to pushing a lawn mower, a surface cleaner attaches to either a hot or cold water pressure washer, cutting cleaning time and user fatigue dramatically. Telescoping Lance - attach to your pressure washer to clean tall buildings easily. Lances can extend up to 24 ft.
Sandblaster kits - attach to a pressure washer and can be used to remove paint, corrosion, scale build up and coatings from equipment in no time. For pressure washer parts and accessories, one call does it all! Contact PSI Equipment today!